At Miami Eye Center, we’re excited to offer AcrySof® ReSTOR® intraocular lens (IOL), a breakthrough in vision surgery. With advanced cataract surgery, this revolutionary lens technology can treat both presbyopia and astigmatism with one lens, eliminating the need for glasses after surgery. 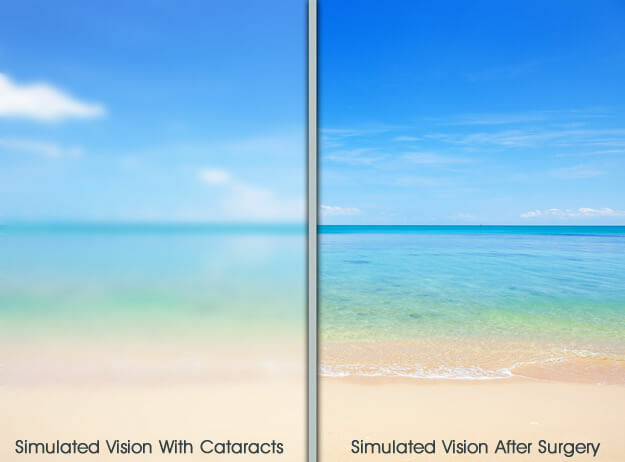 AcrySof® ReSTOR® has been uniquely designed to improve vision at all distances— near, far, and everything in-between— giving cataract patients their best chance to live free from glasses and contacts. 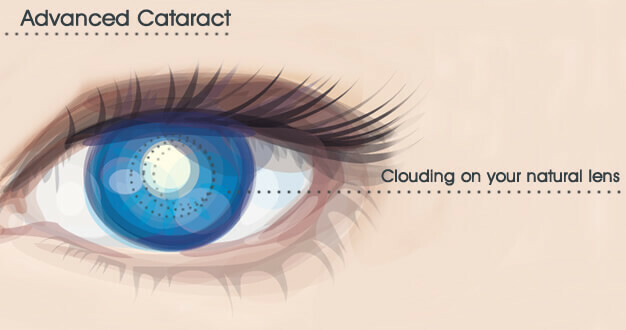 Cataract surgery at Miami Eye Center is an outpatient procedure that only takes a few hours. Upon arrival, your eyes may be treated with eye drops and anesthetic to minimize any discomfort. During this routine operation, a small incision is made in the eye. Dr. Selem will use a tiny instrument (about the size of a pen tip) to break your natural lens into tiny fragments and remove those tiny fragments from your eye. This process is called phacoemulsification. Once phacoemulsification is accomplished, your surgeon will insert an artificial intraocular lens (IOL) into your eye to replace your natural lens. As light passes though the cataractous lens, it is diffused or scatters. The result is blurred, defocused vision. A small incision, barely noticeable, is made for phacoemulsification. The eye will be numbed prior to this incision. The Phaco probe will break up the natural, clouded lens. These pieces of lens are removed from the eye. The arms that keep your new lens centered and secure are made of the same, soft, acrylic material as the lens body. Your new, AcrySof® ReSTOR® lens in folded and gently inserted into the eye in replacement of your natural lens. Patients may return home the same day as surgery. Within the next 24 hours, Dr. Selem will want to see you for an evaluation. Drops will be prescribed to guard against infection and to help your eyes heal. For a few days, you may need to wear a clear shield, especially at night, to prevent anything from rubbing against your eye. Until recently, life without reading glasses or bifocals was not an option for most cataract patients. Now at Miami Eye Center, you have another option. The AcrySof® ReSTOR® IOL is a unique, technological innovation that can provide you with quality vision throughout the entire visual spectrum— near-to-distance— with increased potential independence from reading glasses or bifocals! As we perform daily activities such as reading, watching television or working at the computer, our eyes are constantly focusing on objects at varying distances— up close, far away and everything in-between. The ability to quickly change focus throughout this range of vision is called accommodation. Unfortunately, this ability diminishes as we grow older, causing us to become dependent on bifocals or reading glasses. The AcrySof® ReSTOR® IOL was designed to provide quality near-to-distance vision by combining the strengths of apodized diffractive and refractive technologies. Similar technology has been used for years in microscopes and telescopes to improve image quality and has now been patented for use in intraocular lenses. The AcrySof® ReSTOR® IOL is a multifocal lens that can be implanted at the time of cataract surgery. The lens has multiple small rings that allow you to see up close and distance without glasses. AcrySof® ReSTOR® uses a process called apodization to create a smooth transition from distance to intermediate to near vision. This allows you to function independent of glasses for most daily life functions. Single vision implants Apodization is the gradual tapering of the diffractive steps from the center to the outside edge of a lens to create a smooth transition of light between the distance, intermediate and near focal points. Diffraction involves the bending or spreading of light to multiple focal points as it passes through the lens. On the AcrySof® ReSTOR® IOL, the center of the lens surface consists of an apodized diffractive optic, so both of these features work together to focus light for near through distance vision. Refractive Technology Refraction involves the redirection of light passing through the lens, to focus on the retina. The refractive region of the AcrySof® ReSTOR® IOL bends light as it passes through the lens to a focal point on the retina. This outer ring of the AcrySof® ReSTOR® IOL surrounds the apodized diffractive region and is dedicated to focusing light for distance vision. Range Of Vision For most patients, the AcrySof® ReSTOR® IOL delivers excellent near and distance vision, and good intermediate vision. In fact, with this increase in vision quality, AcrySof® ReSTOR® IOL patients can pass the visual acuity portion of the driver's license exam in most states without the aid of reading glasses or bifocals. Quality Vision During the AcrySof® ReSTOR® IOL clinical studies, patients experienced lifestyle enhancement through quality vision and greater freedom from reading glasses and bifocals. In fact, according to the AcrySof® ReSTOR® clinical studies, four out of five patients with the AcrySof® ReSTOR® IOL reported never wearing glasses following cataract surgery in both eyes, compared to only 1 out of 10 patients with monofocal lenses. This is the highest level of freedom from glasses ever demonstrated in an IOL clinical trial. Is advanced cataract surgery right for me? At Miami Eye Center, Dr. Joseph Selem will meet with you during your private consultation to assess your individual situation. Dr. Selem can help you decide if advanced cataract surgery in Miami is right for you. See the beauty in yourself and the world around you in crisp, clear detail today! Request an appointment online or call Dr. Joseph Selem and the staff at Miami Eye Center at 305-444-0221 to schedule your private consultation.